I was approached by a journalist from the Milwaukee Journal Tuesday regarding my submission to Common Pitch Milwaukee. This is the article she wrote wherein my quote is completely out of context and much of what I said was left out. This post exists to set the context right. As some of you may know, I was very excited to read about Common Pitch Milwaukee. As soon as I read on their site: “We’re on the hunt for eight promising startups working hard to redefine business in America. The best candidates will represent products or services that improve on (or completely reinvent) an existing American industry, helping to make it more sustainable, more profitable, more community oriented, more ethical – and maybe even more fun.” I knew I had to do it. “Hi, I’m Natali. Some people know me as UberDork Girlie and this is my pitch about UberDork Cafe. There will not be pie charts or a soundtrack or fancy graphics. Just a story. You see, once upon a time there was a single mom that struggled finding a place where her and her daughters could hang out. Looking for things to do during a Wisconsin winter turned depressing. Having crayons and chicken fingers doesn’t automatically make a place kid-friendly. Very few places offered classes and activities for kids and their parents to bond and those that did were outrageously expensive. So, she started thinking. What started out as creating a place for her and her daughters to hang out at ended up being the idea of a home for an entire community. UberDork Cafe is a cafe, a gaming center and a classroom all in one. The cafe will serve a slight twist on simple food that is made with local ingredients and stuff from the 900 sq foot urban garden space we rent. Kids will be able to build their own yogurt parfaits, whacky sandwich combinations and have their own area to sit, eat and play. And adults will get a toy with their meals and be able to get some work done while they keep an eye on their kids. Board games, old school atari, 360s and pcs will be there to play. Family gaming nights will occur weekly. The classroom will offer a ton of classes from art to science for kids and families and even just adults. Teens can learn how to make their own Comics. Families can take “Dinner and Movie” where they learn how to make their own movies and on the last night everyone makes homemade pizza and watches them. Unschoolers will have a place to meet and group teach while their kids receive social interaction. Parents will have a place to drop their teens off at where they know they will be safe but still be able to be teens. Local artists will have walls to hang their art. Community members will have opportunities to mentor, tutor, play, create, learn. And every year scholarships will be given to inner city youth that have been a part of the cafe and are going on to pursue secondary education in a tech or science-related field. From the application, the video pitch was made out to be the main part. Guess not. In fact, they would admit after they posted who made it through, that they never even bothered to watch the video pitches. That they had no intentions of doing so until after they had the “short list”, meaning the 8 picked. Why would you ask for them and then not watch them? How are you going to pick from the answers of those simple questions? I wanted to figure out what I had done wrong. What I could do differently next time. So, I went to look at the chosen 8. First on the list- brighter12 An “online companion for working a 12 step process.” I have seen and heard of other resources for 12 steppers. I checked out the entire site to get a feel for what would make them different. Then I clicked on “our team” and there, plain as can be, under “Our Business Partners” - Spreenkler, Innovation in Milwaukee and Manifesto. 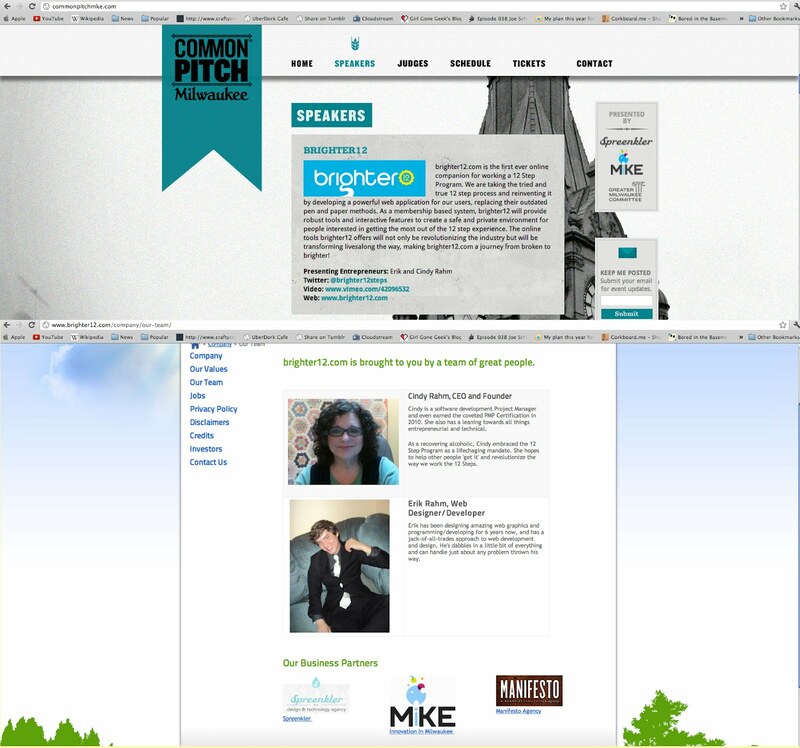 Who is presenting Common Pitch Milwaukee? Spreenkler and Innovation in Milwaukee. Can you honestly say that you wouldn’t have thought “WTF?! ?” too? The fact that they would pick their business honestly broke my heart a bit. These are groups that claim to exist to bring in, nurture and support people who want to open businesses that change Milwaukee for the better. Groups I was looking forward to working with in the future. Groups that involve people I had respected. Groups that didn’t even bother to watch the videos people made for their pitch. Groups that just picked their own. That’s how it feels and it is certainly how it looks. No matter who picked the 8, (which I still have no clue, the rejection letter was from Art Milwaukee? They aren’t even on the Common Pitch Milwaukee site?) the moment that a business partner came up, something should have been said. Then there is the fact that only 3 out of the 8 are from Milwaukee. I understand both sides of this coin. One is “Why have it here if it’s national?” One is “It gives Milwaukee more exposure.” I’m down the middle. Hell, one company is from Chile?? That certainly doesn’t fit in with “eight promising startups working hard to redefine business in America” and it’s concept is far from unique as well. But, I’m sure there is some sort of reason that it would be picked over all the entries they got. Right? Bottom line- there was a better way to achieve both. I LOVE Milwaukee. I am all for anything that helps bring in new talent, that showcases the best we have to offer. I am far from some “MilTownHater.” (Seriously is that even a real phrase?) And I certainly did not set out to rock any sort of boat or piss anyone off. You know what though? I know I’m not alone in this. I know there are many others that are mad as HELL about this and all that lies underneath. And let me tell you, this is all just the tip of the iceberg. There is some disturbingly dark stuff underneath all of this that just keeps going and going. Things I never wanted to know and would rather that I didn’t. But, somethings you can’t un-see or un-know. And all those people out there that are upset about this, that are feeling confused and disillusioned, they had great ideas too. Ideas that would help make Milwaukee even more awesome. But, where are they to turn now? It’s not just about not having the opportunity to pitch at this event. It’s about the whole week and the organizations involved and the feeling that this one event manages to put out there. At the very least, you can say that this was handled REALLY poorly. And if that pisses people off, than so be it. Ms. Gallagher already put my name out there connected to this mess, I’m gonna own up to my thoughts on it. Thoughts that may not be popular. Thoughts that have already upset people that matter far more than I do in this city. But, just like this city that I love, they are mine. I wish nothing but the best for all of those pitching tonight. And to the organizations that are attached to this mess. Hopefully they will find their way back to their mission statements someday. The first cup of coffee for them at the cafe is on me. Update: "'Our event is designed to bring attention to entrepreneurs, to celebrate entrepreneurialism and to involve the community in bringing support to people that desperately need it,' said Carmel Hagen, Common's chief marketing officer." A start up that was chosen initially based on their Kickstarter. At the time they were chosen, it was at $230,000. Their goal was only $30,000. So they were chosen when they were already $200K OVER their goal. They ended at $291,493. It’s an awesome concept and I’m all for creating more manufacturing here in the US. When someone has already raised roughly $261,000 OVER their goal, why not give that slot and that $10,000 to someone who does actually desperately need it? What did the people that didn't win get? A GIANT SCREW PAINTED WHITE. Seriously. The people behind this event thought it was so funny too. I'll save you the "well see, a big stink was made over brighter12 being a business partner for no reason, because they didn't win." Regardless of whether or not they won, it was still unethical they were on that stage to begin with. Whether anyone wants to come forward and say it or not, this one event has done A LOT of harm to the very community this week was to be about. No matter what the groups involved and their friends will say. Natali, I don't even know what to say. Common Pitch is sounding more and more shady, which is sad as it sounded like such a good thing. I wish the cafe could have gotten the financial boost, but at the same time, wonder if getting said boost from Common Pitch would have been more trouble in the long run? I just don't get a company/event acting this way. Why put out an offer, then basically ignore their own rules? I can imagine the roller coaster of emotions this has put you through. I know how I would have reacted through all this, and I know how much work you put in to your pitch. And not just you, but all of the people that applied. It's one thing to be a shady group, but to get the hopes of so many people up, just to say "No, we are supporting our friends instead." is another thing all together. *ginormous huggles* Thank you. Thank you so very, very much. That's the thing. I've see some of the other videos that people made. I've seen the heart and soul people have put in to them. All these orgs are supposed to stand for helping them. Fortunately, most of them probably don't realize what I stumbled upon by accident. And you're right, it would have been nice, but not this way. I don't want the cafe associated with such a thing. Hopefully lessons will be learned and things will change for the better. The cafe will happen in spite of these supposedly helpful organizations. Soon, Natali, soon. Good recognizes good, and as that that didn't happen here, well, draw your own conclusions. After reading that and doing some google fu, it seems things may be best as they are now, for now. I, for one, will have one amazing reason to visit Milwaukee soon. Plus, my kid and I can make BITCHIN' pizzas. Maybe they meant to call it "bait and switch". Sorry you went through this.